VANCOUVER, April 3, 2018 /CNW/ - Power Metals Corp. ("Power Metals Corp." or the "Company") (TSX VENTURE:PWM)(FRANKFURT:OAA1)(OTC:PWRMF) is pleased to announce the planning of a geological mapping program at its Paterson Lake Property, located 60 km north of Kenora, Ontario, that will commence in the coming weeks. The purpose of the mapping program is to confirm the location of the known petalite pegmatite dyke outcrops and historic drill collars for a future drill program. The mapping program will also search for petalite (lithium ore mineral) in multiple other pegmatite dyke outcrops on the Property. The mapping program at Paterson Lake will run concurrently with the recently announced 15,000 m drill program at Case Lake (see press release dated April 2, 2018). Dr. Selway, VP of Exploration, stated "Paterson Lake has a staggering amount of pegmatite dykes identified on surface, along with lithogeochemistry anomalies and soil anomalies that have not yet been explored. All of this contributes to huge potential of finding more lithium mineralization on the Property. I look forward to the results of the mapping program." Paterson Lake Property occurs within the Separation Rapids Greenstone Belt which is also home to the Big Whopper and Big Mack petalite pegmatites (Figure 1). Separation Rapids Greenstone Belt is known as the Bird River Greenstone Belt in Manitoba which hosts the Tanco pegmatite. Petalite (LiAlSi4O10) is the high temperature lithium aluminosilicate whereas spodumene (LiAlSi2O6) is the low temperature/high pressure lithium aluminosilicate. Power Metals' Paterson Lake property consists of 7 mineral claims, 68 claim units and 1088 ha within the Paterson Lake and Treelined Lake Areas. The Property is approximately 7 km x 3 km in size. Power Metals optioned the Paterson Lake Property in 2017 because the property has multiple known petalite pegmatite dykes on surface, but yet is still underexplored. A preliminary review of the historic geological data on the property indicates there are 9 named pegmatites and multiple unnamed pegmatites on the Paterson Lake Property. Of the 9 named pegmatites, 7 have petalite identified on surface and/or in drill core. The ground was historically held by Tantalum Mining Corporation of Canada Limited (Tanco) who explored the ground for tantalum (Ta). Tanco completed drilling on the Paterson Lake Property: 3 diamond drill holes, totaling 283 m in 1996; 5 drill holes, totaling 516 m in 1997 and 3 drill holes, totaling 723 m in 2000-2001. The majority of the pegmatite in drill core was not assayed for lithium even though petalite was present, as Tanco's focus was tantalum. Tanco also completed lithogeochemical sampling, soil sampling and geological mapping between 1996 and 2003. On the Paterson Lake Property, Tanco identified 11 lithogeochemical anomalies based on Li+Rb+Cs contents of grab samples and 7 enzyme leach B-horizon soil anomalies based on multiple indicator elements contents in soil samples. The majority of the area covered by Tanco's lithology and soil anomalies have not yet been drill tested. 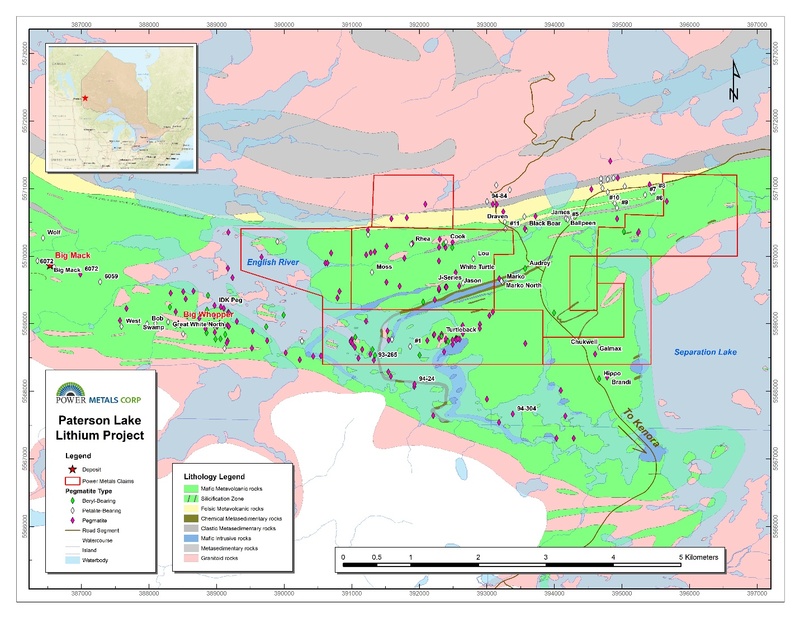 Figure 1 Paterson Lake Lithium Project geology and pegmatite occurrences map.